Has Utah&apos;s UTOPIA network found a savior? Technology • Australian firm may take over the project that has left Utah cities saddled with debt. 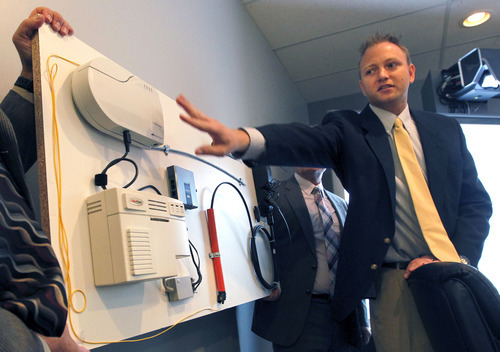 Al Hartmann | The Salt Lake Tribune UTOPIA director of network engineering Roger Timmerman shows the company's fiber-optic hardware at their corporate office Tuesday June 12. Utah has the fastest broadband Internet speeds of any Western state and one of the fastest in the whole country, according to the latest report from Internet content delivery network, Akamai Technologies. UTOPIA is one of the few municpal Internet networks in the country that offers 1 gigabit of speeds to consumers. 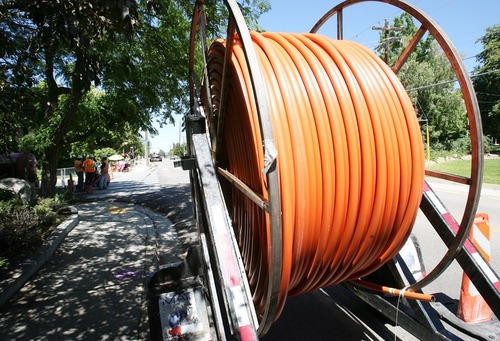 Steve Griffin | Tribune file photo UTOPIA crews make a path for orange conduit, which will house cables for the fiber-optic network that several Utah cities, including Orem, have embraced. Steve Griffin | The Salt Lake Tribune A work crew for UTOPIA, works near 2000 north Main Street in Centerville, Utah Monday, August 22, 2011 as they prepare to lay conduit under the road. 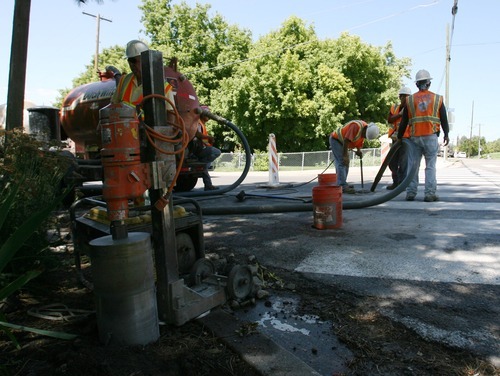 The conduit will house fiber optic cables. Utah has the fastest broadband Internet speeds of any Western state and one of the fastest in the whole country, according to the latest report from Internet content delivery network, Akamai Technologies. UTOPIA is one of the few municpal Internet networks in the country that offers 1 gigabit of speeds to consumers. A large but little-known Australian investment company could pump millions of dollars in capital and expertise into finishing construction of the long-troubled fiber-optic network known as UTOPIA. Macquarie Capital Group, a Sydney-based firm that advises and invests in public projects around the world, announced Thursday it will launch an engineering and feasibility study of completing and operating the controversial high-speed public network, which has struggled with debt, mismanagement and remains unfinished in all but of a few of 11 Utah cities involved. The firm&apos;s study over three to four months will determine the engineering hurdles to build out, the costs, possible service levels and the feasibility of making it profitable, said Nick Hann, senior managing director with Macquarie. "We&apos;re excited by the opportunity that Utah presents because we think the environment and level of education, the work force, the fiscal responsibility in Utah is a very attractive long-term investment," Hann said Thursday. "UTOPIA has created a good base." Utah officials, meanwhile, said Macquarie&apos;s interest was a hopeful sign for UTOPIA, as it slowly gained financial stability after years of problems. "The issue is all about scale and getting the network built out, and this [Macquarie&apos;s proposal] is potentially the best way to do that," said Wayne Pyle, West Valley&apos;s city manager and chairman of UTOPIA&apos;s board. A key player on Utah&apos;s Capitol Hill, Sen. John Valentine, was briefed on the deal Thursday as Macquarie officials reached out to several state and city officials. Valentine, an Orem Republican who has at times criticized UTOPIA&apos;s financial practices, called the idea of exploring an equity partner "intriguing." "It&apos;s a step in the right direction," Valentine said, "but there are obviously a lot of details to work out." UTOPIA was created 11 years ago to deliver high-speed access to businesses and homes in select cities from Brigham City to Payson, at speeds of one gigabit per second for both downloads and uploads, up to 200 times faster than those available from private vendors such as Comcast. The network known as UTOPIA  short for the Utah Telecommunications Open Infrastructure Agency  has struggled with problems over its construction, management, poor decisions and sour deals with various vendors. In order to pay for the network, the cities have issued two rounds of bonds putting them on the hook for up to $500 million in debt, backed by tax money but meant to be paid off with revenue from customers drawn to the network&apos;s light speeds. At last report, UTOPIA had signed up nearly 11,200 subscribers  well short of the original potential  and many of the neighborhoods in its cities have not been wired for the service. That, in turn, has put millions of taxpayer dollars from city sales and franchise taxes on the line, in some cases, drawing voter protests, tax hike proposals and eating into budgets for other city services. Known primarily for transportation projects, Macquarie Capital Group is a subsidiary of Macquarie Group Limited, an Australian investment and management firm with 70 offices in 28 countries and employing 13,900 people globally. The company has a market capitalization of $14 billion and has invested $1 billion in U.S. projects alone. Macquarie has invested in or advised on 114 businesses globally including airports, roads, bridges, rail projects, sea ports, water and gas projects, and communications businesses in television, telephone and radio. Macquarie Capital advises on and invests in corporate and government services such as infrastructure and utilities projects. If Macquarie were to buy and take over the build-out of UTOPIA, it would be the company&apos;s first investment in a fiber-optic network. Hann said Macquarie offered a proven track record of bringing projects in at a specified cost, on deadline while shifting risk from the public to the private sector. Macquarie&apos;s investors  including pension funds, large insurance firms and private endowments  were seeking to develop stable, long-term investment opportunities and were drawn to technology-based projects, Hann said. If the feasibility study proves fruitful and Macquarie agrees to take over the network, it likely will entail a deal in which the firm would assume management of the network for 30 years and invest in building out and upgrading the rest of the lines to neighborhood homes, Hann said. The network would remain an open-access network and Macquarie would partner with third-party Internet service providers, he said. Macquarie would assume all risks with any new debts incurred in finishing the network, Hann said, but the cities would still be responsible for paying off the original debt. Member cities would continue to own the full network and they would receive an as-yet-undecided percentage of any profits it generated, he said. Pyle, in West Valley City, said he believes UTOPIA&apos;s outstanding debt can be covered by existing tax revenues. But his biggest concern, he said, is ensuring the network is completed so it can take on more subscribers. Macquarie Capital is a Sydney, Australia-based investment and management firm that specializes in private-public partnerships with governments. It invests in and manages projects such as roads, bridges, cellphone towers, seaports, and gas, water and electricity projects. Offices • The parent company, Macquarie Group, has 70 offices in 28 countries. It employs 13,900 people. U.S. projects it has backed • Chicago Skyway, Dulles Greenway, Hawaii Gas, Elizabeth River Tunnels, and Penn Terminals. Macquarie Capital is conducting a feasibility study to see if it makes sense to invest in and take over the UTOPIA high-speed fiber-optic network. If the firm agrees to assume responsibility for UTOPIA, it would pay for and manage the completion of the network to homes and businesses for 30 years. The 11 cities that are members of UTOPIA, however, would still have to pay off the initial debt from two rounds of bonds, which could total around $500 million.